Preheat the oven to 150°C, gas mark 2. Put the olive oil in a daubière or casserole. Add ¾ of the pancetta, then the vegetables. Arrange the beef on top. 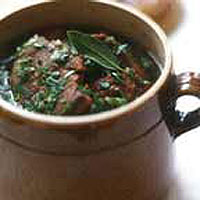 Flatten the garlic cloves with a knife and bury among the meat, along with the bundle of herbs. Cover with the rest of the pancetta. Place on a medium heat, and begin to cook, uncovered. After about 10 minutes, pour the wine into another pan, bring it to a fast boil. Pour the bubbling wine over the meat. Cover with a lid and transfer to the oven for about 2½ hours. Remove the herbs and serve, sprinkled with a little persillade. This is good served with a wide, rippled pasta such as pappardelle, mixed with some of the beef's juices.